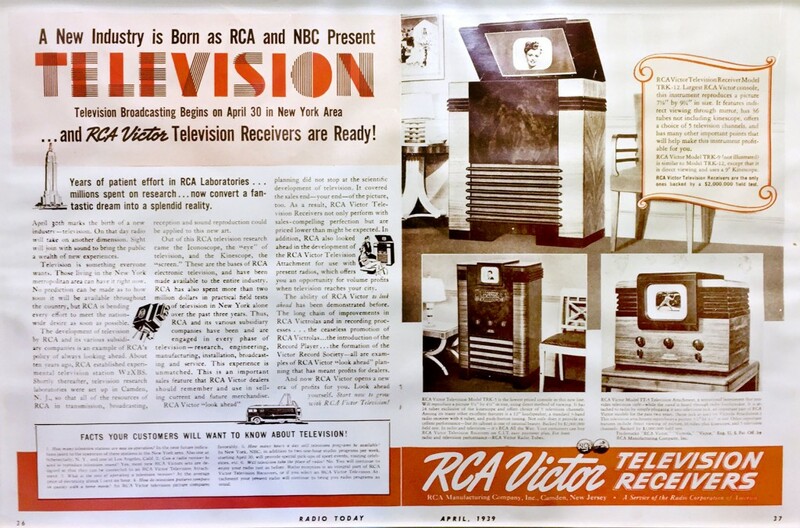 RCA offered four types of television receivers for sale in 1939: the TRK-12, the TRK-9, the TRK-5 and the TT-5. The set prices, ranging from $199.50 – $600 US, were considered high. Advertising was initially aimed at the wealthy, depicting viewers who were dressed in suits and evening gowns while watching their TVs. John Vassos designed all of the RCA sets during this period. The hand crafted, highly polished wood cabinets took their cue from the newly popular “streamline” style. The sets received channels 1 to 5 (the frequency for channel 1 had not yet been taken over for military use). The RCA sets were offered for sale in Macy’s, Bloomingdale’s and Wanamaker’s department stores in the New York Metropolitan area. Although shoppers were curious, prices were high and the ensuing sales in 1939 and 1940 were disappointing for retailers and manufacturers.